Our stackable, interlocking concrete blocks available for purchase only, are a flexible solution for when you need to quickly create a concrete block wall, solid perimeter, storage bay or barricade. Our interlocking concrete blocks simply slot on top of one another to create a sturdy wall perfect for deterring trespassers and creating a perimeter but with the option to dismantle and remove afterwards. This makes them perfect for events and exhibitions. Available in two sizes, concrete blocks give you the flexibility to easily create a large scale concrete barrier wall any time, anywhere. 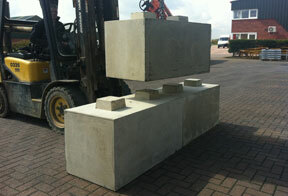 Polysafe are a leading concrete barrier supplier. Take a look at our standard sizes below and then visit our before ordering and site preparation pages for advice on placing your order. All measurements are in mm. Alternatively, if you would like to speak to someone directly call our sales team on 01778 560555 or go to our contact us page.